Molly Batters is a successful cookbook and romance writer living in Battersby Hall. When she meets and falls in love with publisher Mr Tidy, all is set fair for a fine romance. They are both widowed, both dog lovers, and both grasping rather awkwardly at a second chance of happiness. However, their love is threatened by the dark plans of those around them, including the menacing gardener, Thompson. Set in 1960s Yorkshire and London, this is a brilliantly quirky book which will have you up all night to find out whether Molly and Mr Tidy will live happily ever after, or be swept away by the dastardly passions of those working for them. 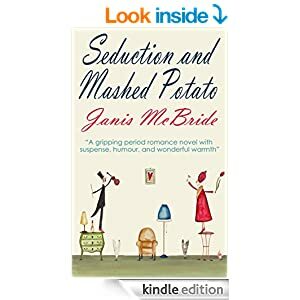 Seduction & Mashed Potato is Janis McBride’s debut novel. Look out for her short story collection "New Shoes & Other Stories" available now!